“Everything in moderation.” That oft-quoted phrase is a bit clichéd but remains sound advice for many aspects of our daily lives...even oral hygiene! Too much brushing can lead to gum recession and tooth wear. Too much flossing can aggravate and harm the gums and teeth as well. Too much mouthwash...well mouthwash is the topic of this article. Many of my patients tell me they use a mouthwash as part of their daily oral hygiene regimen. My response is always a cautious vote of approval because when used with proper technique and knowledge, mouthwash is great! However, mouthwash advertising/commercials can be misleading and often evoke perception of a “magic rinse” amongst the public. Additionally, I will always ask “do you know what’s in your mouthwash?” Eyebrows are inevitably raised by the patient at this point in the discussion, and I can understand why. The mass media, and in fact most dentists, do not routinely discuss the possible pitfalls of mouthwash use. As the commercials tout, mouthwash can freshen breath, dislodge trapped food particles, and kill oral bacteria thereby helping to prevent plaque accumulation and gingivitis. These are all excellent attributes, but rinsing with mouthwash should be prioritized! On more occasions than you might believe, a patient will tell me they use mouthwash daily...but in the next breath admit to brushing sporadically and never flossing. This is completely backwards! Brushing 2-3 times per day and flossing 1-2 times per day is the bare minimum for good oral health care. Nothing prevents oral problems more than following these two simple guidelines. The importance of mouthwash falls below these two and falls somewhere near tongue scraping and gargling in the category of what could be called “non-essential, yet excellent, daily oral hygiene techniques.” Plaque is best removed mechanically (i.e. brushing and flossing) and cannot effectively be rinsed away. This is because of the biofilm layer, a sticky "glue" produced by bacteria to keep them anchored to the tooth structure. Patients who rinse with mouthwash and think they are killing or removing all the plaque are sorely mistaken. Imagine taking a shower and just rinsing your body with water. No soap. No loofah or washcloth. Sure you may rinse away some of the most egregious dirt and odor causing bacteria, but would you really classify yourself as clean? I don't think so. In my opinion, proper technique and a quality toothbrush are far more important than mouthwash use. As I often say, “in a perfect world everyone would be brushing with a rechargeable toothbrush like Sonicare.” These toothbrushes have a proven track record, consistently demonstrating significant hygiene improvements amongst patients. Only after regular brushing with a rechargeable brush and consistent flossing are completed with proper technique, should a mouthwash be considered. The second part of this cautionary mouthwash discussion involves the mouthwash itself. Most mouthwashes being used contain alcohol (ethanol) which serves as a medium to dissolve other active ingredients and contributes to that characteristic “burn” while rinsing. Formulations vary from brand to brand, but the amount of alcohol in each is surprising in most. For example, the original gold version of Listerine contains 26.9% alcohol! In comparison, many commercially distilled spirits (i.e. vodka, whiskey, etc) contain 40% alcohol, which is more commonly referred to as 80 Proof. Therefore at 26.9%, original Listerine is essentially a 54 Proof liquid, about 2/3 the strength of an average hard alcohol. Obviously mouthwash is quite potent stuff, which is why it is commonly abused by individuals seeking to consume alcohol when they’re not supposed to...but that’s a different article for a different time. The question I pose today is simple: is extended daily use of mouthwash containing that much alcohol safe? For years, researchers have pondered that question with inconclusive results. The American Dental Association (ADA) continues to place its “seal of acceptance” on mouthwashes containing alcohol. By definition, this means that the product has been deemed safe and effective by their high standards and thorough research. Over the years however, several individual studies have surfaced finding an association between mouthwash containing alcohol and increased oral cancer. For example, in a study conducted by Winn & colleagues in 1991, a positive association the two was found[i]. A more recent study conducted in 2007 by Guha & colleagues found that participants using mouthwash more than twice per day were nearly six times more likely to develop the oral cancer Squamous Cell Carcinoma than those reporting never to have used mouthwash[ii]. A 2008 study published in the Australian Dental Journal made international headlines with a positive correlation finding between alcoholic mouthwash and increased risk of oral cancer[iii]. In response to the study and the publicity it derived, the ADA released their own statement refuting the findings of the study: “"the available evidence does not support a connection between oral cancer and alcohol-containing mouthrinse." Clearly additional research is needed in this debate to come to a definitive conclusion. 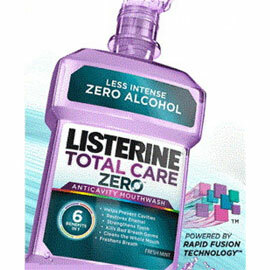 Interestingly, Listerine and other manufacturers released their new line of alcohol free mouthwashes (Listerine Zero, Crest Pro Health Care, etc) the year after the Australian Dental Journal study was published. It’s wonderful and important to have these alcohol free mouthwash options as they provide a choice to the consumer, but as I mentioned earlier, I place far more importance and emphasis on A) brushing/flossing habits and B) Toothbrush type than any mouthwash (alcohol or not). In my household, we do not use mouthwash regularly, but when we do, it’s alcohol-free. Until conclusive research is conducted, the decision on whether or not to use alcohol-containing mouthwash will remain a matter of personal preference. If you would like to speak about mouthwash, oral cancer, or any other dental topic, please feel free to call the office and schedule a complimentary appointment with me. Email and Twitter are also available options. I am extremely passionate about modern dentistry and love discussing it with patients, so don’t hesitate to contact me. [i] Winn D M, Blot W J, McLaughlin J K et al. Mouthwash use and oral conditions in the risk of oral and pharyngeal cancer. Cancer Research 1991; 51: 3044-3047. [ii] Guha N, Boffetta P, Wunsch Filho V et al. Oral health and risk of squamous cell carcinoma of the head and neck and esophagus: results of two multicentric case-control studies. American Journal of Epidemiology 2007; 166: 1159-1173.